Hello, my name is Ferry, and I'm a musician. 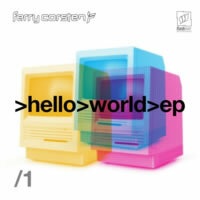 So, electronic superstar Ferry Corsten's going to be releasing a series of EPs, all entitled "Hello World", throughout 2015, eh? I've never been quite sure why artists do that when they could easily just put it all on one albu—MONEY. Now I get it. In any case, Ferry put out the first EP of his "Hello World" releases in February 2015. First on the docket is Back To Paradise featuring the vocals of Haris, who previously appeared on Hardwell's 2015 album, "United We Are". Piano backing that wouldn't be out of place on any lite-hits radio station, Haris shares his boy band/Chris Martin chops as we are lead into a more modern electro-trance chorus filled with arpeggiation that, while not outstanding, will likely cause more than a few arms to flail in the air at future DJ concerts and is not at all an unpleasant listen. Perhaps I just miss the signature Ferry style, which is not at all apparent in some of his latest tunes. The rest of the EP shall tell! Next is Ferry Corsten's Beat As One with Angelika Vee on vocals. This one's a much harder electro jam that turns into a trancy tune at a moment's notice. I love that electro synth that he's using — it digs into your ears like a frisky worm or a determined sushi roll. Angelika's vocals are actually pretty awesome, a stark improvement over some of the other vocalists he's been collaborating with lately. She (and that synth that makes my headphones sensually vibrate) are the highlights of this track; the instrumental chorus contrasts with it and adds a bit of weakness overall, which is a shame because the rest of the song is great. Entering new territory, Tonka (which is possibly named after oft-forgotten artist DJ Tonka or, more likely, a toy truck brand) is a solo instrumental excursion, and a weird one at that. It's not something I would have expected from the Corst-man, but here we are. A variety of different layers of fuzzy and sharp buzzing synths alike introduce us to the weird spacey concept before the tempo slows down to a crawl and his melody hits us once again. Nothing spectacular again, but crowd-pleasing, it'll probably be. Sadly, this track could've been half the length, as it offers very little in terms of variety past the halfway mark. Just one more question: where did the female vocals come from in this song? There are no credits for any female vocalist; she just shows up. The edition of the Hello World EP comes with a couple of bonus mixes, too! There's Back To Paradise (Flashover Mix) (which is more or less a remix by Ferry Corsten of his own track for a club-friendly vibe), and he manages to make it better by doing one thing right: at about the 2:58 mark, the chorus has been made harder and grittier thanks to gruffer synths and the inclusion of a zippy noise that is just a great addition. Frankly, this mix blows the other one out of the water and may just be the highlight of the EP. Ferry also drops Make It Ours (Flashover Mix) on us; I didn't really want another version of this, but we got it anyway. He sprinklesdhis magic Ferry dust all over this track and made it much harder in the process, resulting in a far more interesting version that makes me forget those now-generic tormented soul man-vocals. Well, almost. There's still there. Hello World EP 1 is a mixed bag. There is definitely some funk to this package, but Ferry should be a bit more selective with his vocalists and also not be so stingy with catchy tunes in favour of more humdrum ones. I actually do look forward to the next EP packages and I hope he gets a little more experimental, too, instead of settling into the same sound as everyone else.